Families come first in our group of Small Town Texas Masons. In 1998, after living in the Humble area of north Houston for 42 years, we moved to the little community of Pine Islan d. It's 45 miles west of Houston, between Waller and Hempstead. At the time I was a member of two large city Lodges in the Houston area, but had lost interest in the Lodge and hadn't attended meetings at either Lodge for a few years. After living in Pine Island for awhile a cousin invited me to visit Waller Masonic Lodge #808 AF & AM, 5 miles east of Pine Island, and Hempstead Masonic Lodge #749 AF & AM, 5 miles to the west. After visiting both Lodges a few times, I demitted from the two large city Lodges and joined the 2 local Lodges. 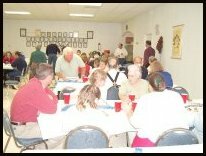 The main thing that attracted me to the small town Lodges was the family social hour and dinner before each stated meeting. On stated meeting nights at both Lodges, Brothers, with wives and children, join together for dinner from 6:30 PM to 7:30 PM. In all my years as a member of the “large city” Lodges, I don't remember ever seeing a wife or child in the building on a regular stated meeting night. We feel the small town Lodge family hours have a very positive effect on families. It gives the ladies the feeling that Lodge night isn't just an excuse for husbands to get away from the wives and children for one night. The Lodges pay for the groceries that the Stewards use to prepare the dinners. Donations to the kitty jar usually come within 15 or 20 dollars of the expenditure, if they don't cover it, and the ladies bring deserts. At 7:30 PM when the brothers assemble in the Lodge room for the Lodge meeting, wives either double up to get a ride home or wait around in the dining room playing cards or dominos until the meeting is over. We feel that the cost to the Lodges are very small compared to the benefits of having our wives socialize and get to know our other Brothers and their wives, they also enjoy some good home cooking without having to cook supper and clean up afterward. Most actually look forward to Lodge night here rather then complain about being left at home alone. I never miss Lodge meetings anymore and best of all, I regained my interest in the Lodge. I am currently the Treasurer and Junior Past Master of Waller Lodge and served as Secretary 6 years for Hempstead Lodge. I also write the newsletter for Waller Lodge and the Masters, Wardens & Secretaries Association and maintain web sites for the Association and both Lodges plus another Masonic web site of my own. But, even more important, is knowing our brothers wives and children and having our having our wives know them and their families. We have developed a much stronger sense of brotherhood then we ever experienced as members of the larger large city Lodges. Brother, I'm glad I found your blog. I also belong to a smaller lodge in Texas and I agree whole heartedly with your observations brother. keep up the good work. I must agree with Bro. Greg, the Masonic Traveler.... I'm glad I found you. You are a refreshing welcome in the Masonic blogosphere.